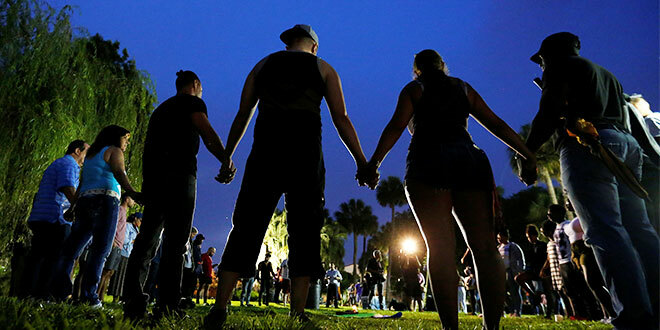 ORLANDO’S religious leaders stood as a “symbol of hope” for the 50 killed and 53 injured in the worst mass shooting in United States history on June 12. Bishop John Noonan of Orlando invited religious leaders, including Imam Tariq Rasheed and ministers from the local Baptist and Methodist churches, to an ecumenical prayer vigil at St James Cathedral, Orlando. The Irish-born bishop, who grew up amidst religious hostility, said the ecumenical presence was an important witness to religious unity and peace. “Our presence here tonight is a symbol of hope,” Bishop Noonan said. Hundreds attended the “Vigil to Dry Tears” on June 13 to pray and light a candle for the victims of the Orlando massacre. The vigil urged the faithful to lean towards peace and beg for God’s mercy on the victims and the gunman who took their lives. “In the Gospel, Jesus wept; he wept at the death of his friend Lazarus,” Bishop Noonan told the congregation. “We come tonight because we too weep – we weep for the loss of our brothers and sisters in our community. “Tonight we come to show that each person is made in the image and likeness of God. A gunman, identified as 29-year-old Omar Mir Seddique Mateen, opened fire at the Pulse nightclub in Orlando in the early hours of June 12. Mr Mateen was killed by members of a police SWAT team and had reportedly pledged allegiance to the Islamic State terrorist group. In a statement released hours after the rampage, Bishop Noonan urged the city to “turn their hearts and souls” to God, “the great physician”. “A sword has pierced the heart of our city,” Bishop Noonan said. Priests, deacons and counsellors from the Diocese of Orlando and Catholic Charities of Central Florida served at an aid centre established by city officials. Bishop Noonan asked attending priests to remain in the cathedral for confessions and to be available in case of requests for spiritual counsel following the vigil on Monday night. He also requested all parishes in his central Florida diocese to include prayer intentions for the Orlando shooting during Sunday Masses. United States Conference of Catholic Bishops president Archbishop Joseph Kurtz of Louisville said the “unspeakable violence in Orlando” reminded the world “how precious human life is”. “The merciful love of Christ calls us to solidarity with the suffering and to ever greater resolve in protecting the life and dignity of every person,” Archbishop Kurtz said. Pope Francis was among the Catholic leaders shocked by news of the shooting, and offered his prayers for the victims, their families and first respondents. In a rare early morning statement, the Holy Father called the shooting “a terrible massacre”. 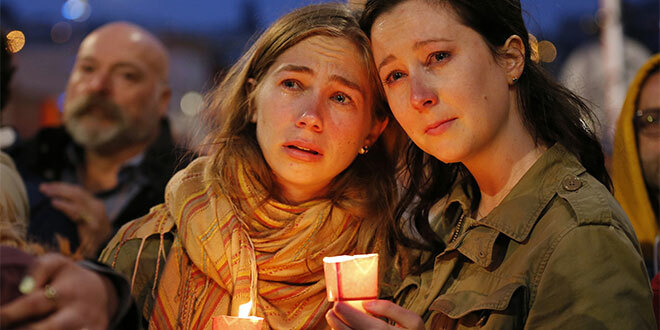 “The terrible massacre that has taken place in Orlando, with its dreadfully high number of innocent victims, has caused in Pope Francis, and in all of us, the deepest feelings of horror and condemnation, of pain and turmoil before this new manifestation of homicidal folly and senseless hatred,” a Holy See statement said. Archbishop Coleridge told The Catholic Leader that condemnation of the Orlando shootings or any acts of terror was appropriate, but should not be a final response. “Given how frequent mass shootings have become, statements of condemnation can seem almost ritualised, part of the script,” he said. “It’s right and important to condemn absolutely the Orlando massacre and all that it represents. While prayer was essential, Archbishop Coleridge said if not paired with action it “could wither into evasion”. “God isn’t an aggrieved spectator of what’s happened in Orlando,” he said.